Gustav Mahler was born into a Jewish family in Kalischt in Morvia, then part of the Austrian Empire. When he was 15 he went to the Conservatory in Vienna, where he studied piano under Julius Epstein, harmony under Robert Fuchs and composition under Franz Krenn. At Vienna University he studied history, philosophy and music. His career as a conductor took him to Ljubljana, Vienna, Kassel, Prague, Leipzig and Budapest. In 1887 he attracted public attention when conducted Wagner's "Ring", replacing Arthur Nicklisch who had fallen ill. From 1891 until 1897 he worked for the Opera in Hamburg. In 1897 he became director of the Opera in Vienna, the most important position in music in Vienna. He produced classic opera's by Gluck and Mozart and worked together with Alfred Roller when he staged Beethoven's "Fidelio" and Wagner's "Ring". In 1902 he married Alma Schindler, who was twenty years his junior and the stepdaughter of the painter Carl Moll. Gustav and Alma had two daughters, Maria Anna (who was callled 'Putzi' and died as a child in 1907) and Anna Justina ('Gucki', she became a sculptor). Criticism to his Jewish descent and his composition led to his resignation in 1907. He accepted an offer from the Metropolitan Opera in New York and worked there in 1908. But Alma was left behind in Europe and their marriage was falling apart. She had an affair and in 1910 he even consulted Sigmund Freud. He signed a long term contract in New York and this time his family went with him. In 1909 he finished his Symphony No. 9, but he wouldn't live to see it performed. In February, 1911 he fell ill with a streptococcal blood infection. Mahler went to Paris where a new treatment had been developed, but he didn't respond to it and he died in May in Vienna, aged only 50 and leaving his "Symphony No. 10" unfinished. At his own request he was buried beside his daughter at Grinzing, Vienna. When he was buried the rain was pouring, but when the coffin was lowered the sun broke through. 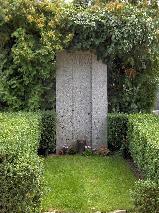 The grave of Gustav Mahler (and his daughter Maria Anna) at the Grinzing Cemetery in Vienna.